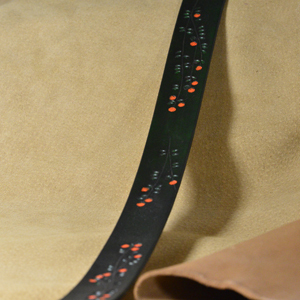 Light brown antique lends a softer tone to this 1 1/2″ belt. Medium edge tooling sets off the excellent grain in the belt center. Don’t forget to select your buckle at the “Our Stuff” tab under “Buckles”. Contact us for a custom belt to complement your favorite buckle. Flowing nature pattern in medium brown antique. 1 1/2″. Don’t forget to select your buckle at the “Our Stuff” tab under “Buckles”. 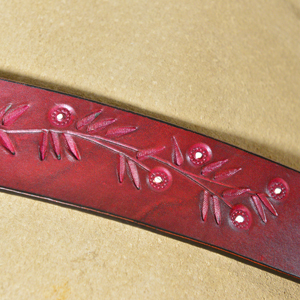 Contact us for a custom belt to complement your favorite buckle. Green over light green with hand painted flowers. Exquisite. 1 1/2″. Don’t forget to select your buckle at the “Our Stuff” tab under “Buckles”. 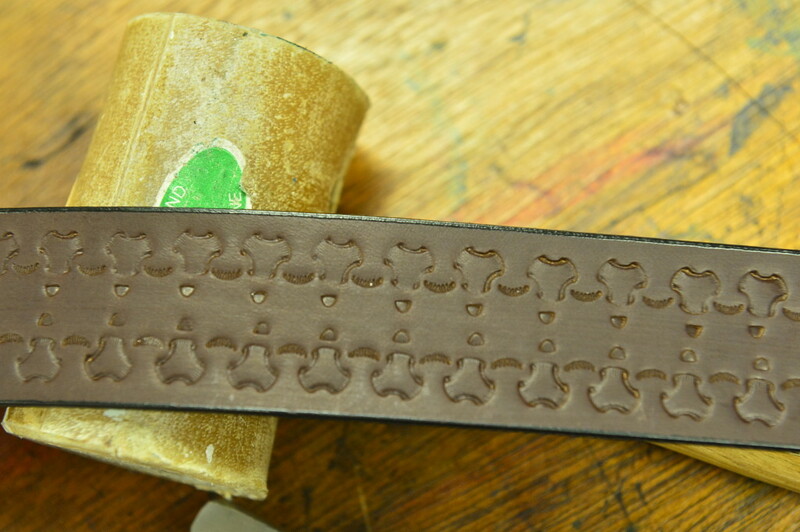 Contact us for a custom belt to complement your favorite buckle. 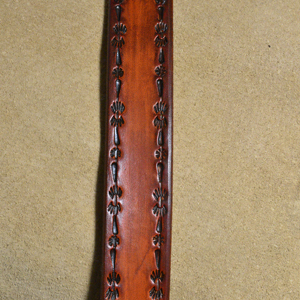 Maroon over red floral with hand painted highlights. This is like a mural for your waist. 1 1/2″. Don’t forget to select your buckle at the “Our Stuff” tab under “Buckles”. Contact us for a custom belt to complement your favorite buckle. One of our most popular patterns. We call it our wheat pattern, although botanists will be quick to point out certain differences between our design and nature. Get a life! Dark brown over yellow. 1 1/2″. Don’t forget to select your buckle at the “Our Stuff” tab under “Buckles”. Contact us for a custom belt to complement your favorite buckle. 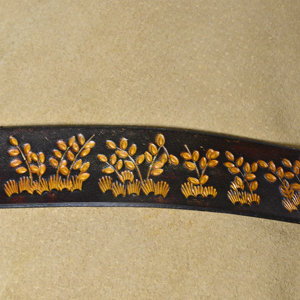 Dark brown border around a lightly tooled pattern. Chocolate antique with chocolate over-brush. Dark on dark for low contrast…sorta tone on tone. Don’t forget to select your buckle at the “Our Stuff” tab under “Buckles”. Contact us for a custom belt to complement your favorite buckle. Saddle tan with medium brown border and highlights. Nice subtle dual border pattern. 1 1/2″. Don’t forget to select your buckle at the “Our Stuff” tab under “Buckles”. 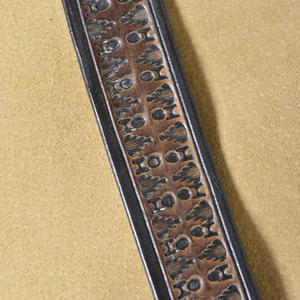 Contact us if you prefer a different width, or if you crave a custom belt to complement your favorite buckle. Black border, black antique, light brown highlights. Sharp…like biting wit. 1 1/2″. Don’t forget to select your buckle at the “Our Stuff” tab under “Buckles”. 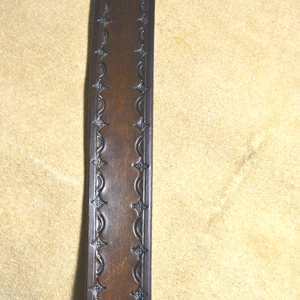 Contact us if you prefer a different width, or if you crave a custom belt to complement your favorite buckle. 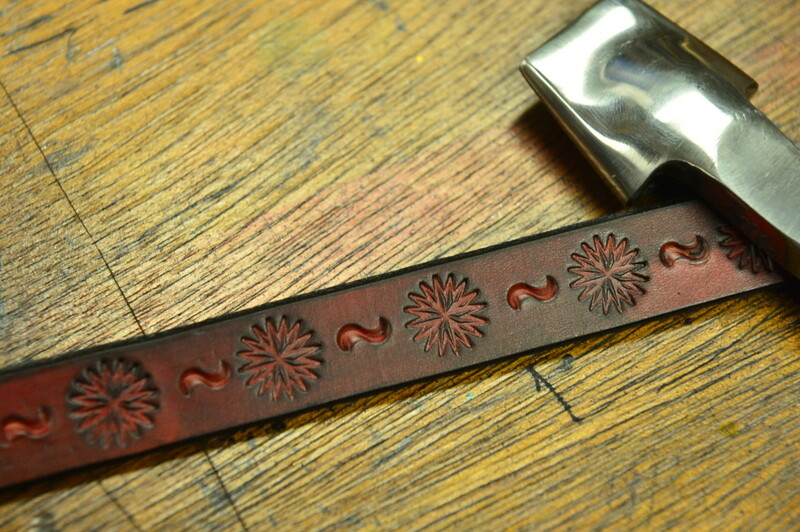 Embossed look for low contrast on this gorgeous latigo strap. This is really exceptional leather. Flexible, supple, etc… Don’t forget to choose a buckle (included in price). Don’t forget to select your buckle at the “Our Stuff” tab under ”Buckles”. Contact us for a custom belt to complement your favorite buckle. 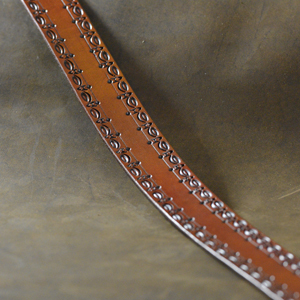 Nice reddish brown hues in this 3/4″ belt, because you can never go too thin. Don’t forget to choose a buckle (included in price). Don’t forget to select your buckle at the “Our Stuff” tab under ”Buckles”. Contact us for a custom belt to complement your favorite buckle.